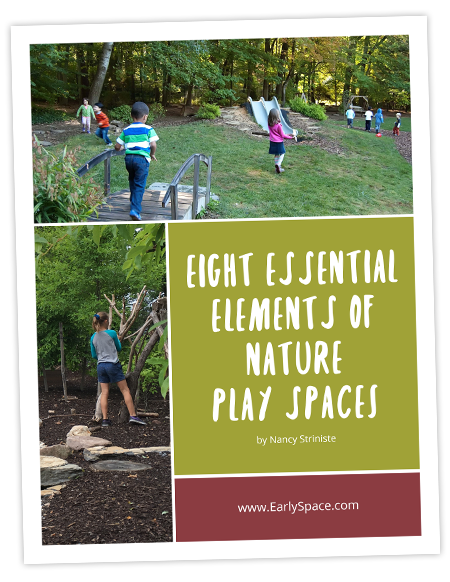 Are you looking for a garden filled with life, color, sound, motion and four season beauty? Do you want to avoid weeding, mulching, transplanting, pruning and most of all watering? 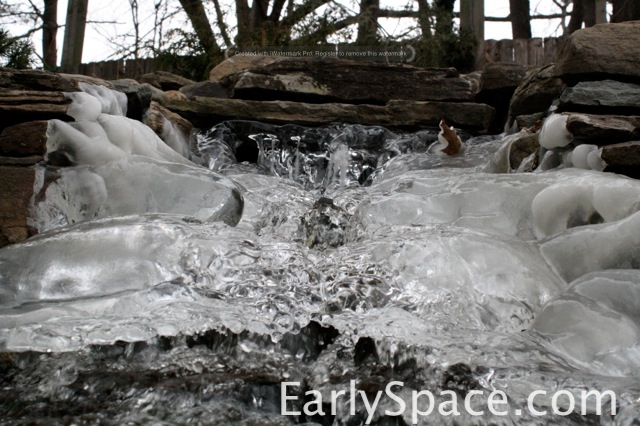 A water garden may sound like a lot of work, but actually, when it’s properly designed and installed, it’s surprisingly simple. A water garden can be anything from a half whiskey barrel to a full garden pond. What it requires is that you create a balanced eco-system, which means water, plants and fish. The fish nibble on the plants and plant debris (plus eat the larvae from insects like mosquitoes!) and the fish waste provides fertilizer for the plants. It’s like magic the way they sustain each other. 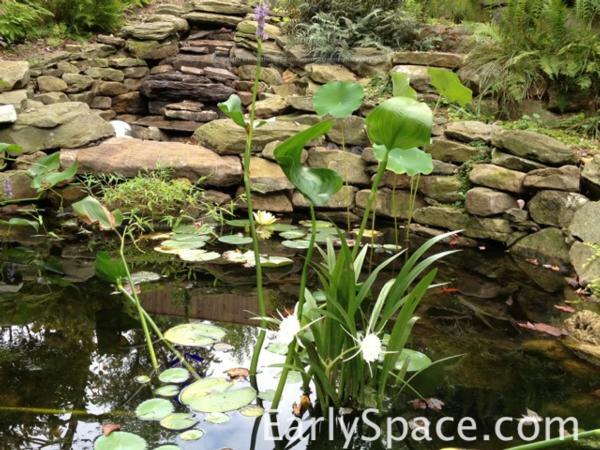 In 2008, to celebrate my 50th birthday, I decided to have a pond built in my garden. I called it my learn-to-design-a-pond pond. Mine is big, two tiers and about 5000 gallons. My son and I went to our local pet store and bought a dozen feeder goldfish. In five years those original fish have had generations of babies. Some of the originals are still there, and they’re big! Some are up to 8″ long. I almost never feed them fish food. They are perfectly content with what they find in the pond. I think at the moment there are more than 40 fish of various sizes living their lives in my pond. I tell them how lucky they are not to have ended up in an aquarium somewhere– or worse! 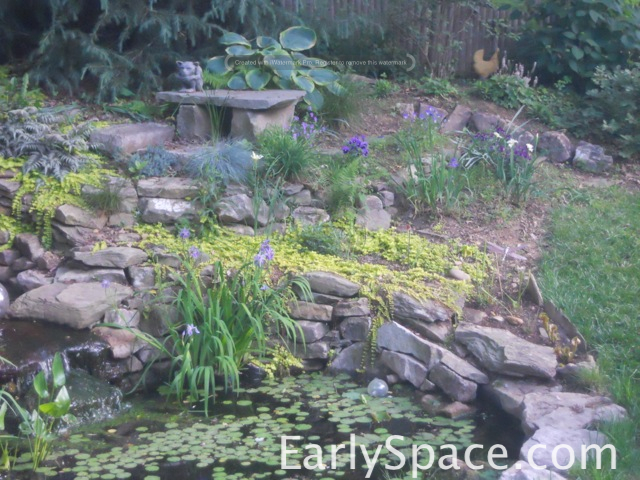 I stocked the pond with an assortment of plants, and five years later I can tell you what the winners were. Iris versacolor is a native iris that fills the edges with beautiful vertical foliage all through the growing season, and a profusion of purple flowers in the spring. Pickerel Rush (Pondeteria cordata) is another native with purple blooms. These spikey flowers appear amongst the glossy vertical leaves from spring through fall and pollinators love them. Nuphar lutea is the Asian Waterlily and Nuphar luteum is the native, commonly called Spatterdock. Both have heart-shaped leaves that float on the water, and beautiful yellow flowers. I’m working on replacing my non-native, but it produces a new bloom every few days in the summer and I love it. 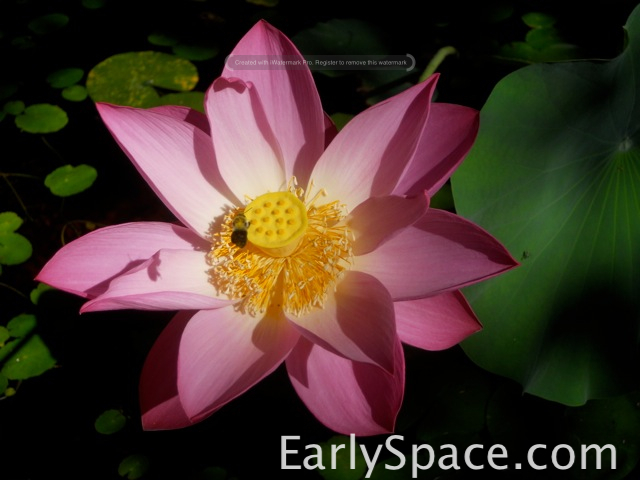 The Lotus, Nelumbo nucifera is sometimes known as queen of the garden. The native species is Nelumbolutea. There are lots of hybrids and colors include white, yellow and pink to fuchsia to red. There are lots of hybrids and colors include white, yellow and pink to fuchsia to red. The first leaves in the spring sit on the surface of the water like water lilies, but subsequent leaves, and the stunning flowers are on stalks from 2-4′ tall. When the flowers pass, they leave a seed pod that is at least as stunning as the flower. The magic of the leaves is that a drop of water behaves almost like a drop of mercury, rolling around on the leaf and never loosing it’s droplet shape. The properties of the Lotus leaf have intrigued scientists who are looking to replicate the “super hydrophobicity” in developing more effective waterproofing. 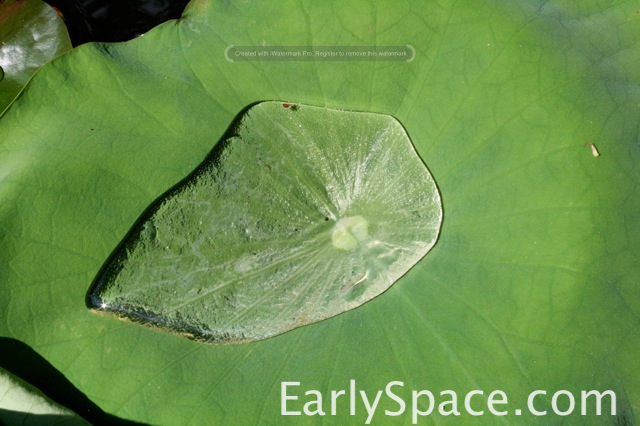 Believe me, Lotus leaves are endlessly fascinating to observe. In addition to the fish and plants I’ve put into my garden, we have lots of wildlife that has found the pond on their own. There are waterbugs, skimming along the surface, an abundance of dragonflies flitting above the pond and their nymphs swimming in the water. We’ve had a few lovely frogs over the years and many many birds come for a drink and a bath. At night I’ve spotted raccoons, a possum and even foxes stopping for a sip. At least once we’ve been visited by a heron, but enough fish survived to repopulate the pond. My pond has a filter and skimmer and a pump that keeps the water circulating and unattractive to mosquitoes. I clean the filter once every few months. Twice a year I wade in and muck out the leaves, which turns out to be a very zen way to spend an hour or so. I leave the pump running year round, so when the temperature drops, the ice sculptures appear and those are as beautiful as the summer flowers.